It's no secret that we enjoy getting the mail around here. However, a large percentage of the times that we break into a new package, my girls' excitement lasts about... well, as long as long as it takes me to remove the bubble wrap. And then all they want is the empty cardboard box. If it's large enough for both of them, they'll climb in... and out... and in... and out... until invariably one of them (Little Sister B) loses interest and walks away leaving the other one (Big Sister E) wailing for the game to continue. Or else one of them (Little Sister B) isn't so coordinated and will manage to fall out of the box, even though the sides are only 4 inches high. Or, my personal favorite, when someone (Big Sister E) manages to get a paper cut on the back of her ear from flapping the sides of the box around too much, even after she's been warned that she might hurt herself. Right. So even though they have fun for a little while, more often than not I toss the box directly into our recycle container so that I don't have to deal with the aftermath. And then one day the Shuttle Imagination from KidsCraft showed up and playing with cardboard took on an entirely new meaning around here. Made in the USA out of 100% recycled material, the Shuttle Imagination has been blasting off for hours of creative play ever since the day we set it up - which didn't take long at all. Designed to be constructed without the need for any sort of tools, there were three main parts to putting this together (and then the three fin attachments to pop on at the end). Following the instructions, a series of flaps and slots came together pretty quickly to hold each of the shuttle pieces solidly in place. And after only a moment or two of admiration ("a rocket, Mommy! A ROCKET! "), both Big Sister E and Little Sister B dove right inside. Happy that the double bay doors, cute cutouts and large portholes gave plenty of light as well as easy access in and out, I was able to sit back and enjoy watching their creativity come to life. In fact, they were having so much playing both inside and outside the Shuttle Imagination that the idea to color on the wonderfully large (six feet tall!) white drawing surface hadn't struck yet. So, when I brought over the crayons, both girls' eyes lit up and Big Sister E asked, "We can color on it, too?" Suddenly a great thing had just become even more amazing. Taking this new aspect very seriously, they both got right to work personalizing the shuttle exactly how they wanted it. The Shuttle Imagination has been ready for takeoff in our living room for quite a while now and the interest level in it has yet to go down. 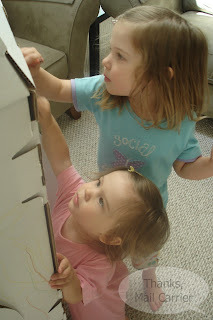 Whether playing individually or together (there is more than enough room for both of my daughters to fit comfortably), each day seems to bring a new adventure and I never know where their imagination will take them next. I love overhearing the conversations going on about where the girls will go next, as well as seeing how much fun they are still having decorating their shuttle. It took a little while before Big Sister E realized they could color on the inside walls as well, so it's not uncommon to see the two of them going in and out with crayons or reaching through the portholes to get to just the right spot. 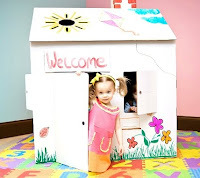 KidsCraft has definitely found a way to focus on a toy that all children love -the cardboard box- and turn it into something almost magical. 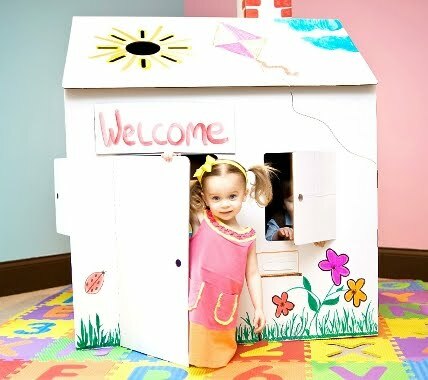 Using strong and durable 100% recycled materials their easy-to-assemble playhouses are sure to last for endless hours of entertainment and hold up perfectly even if you need to move them from one location to another. 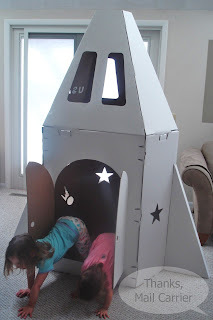 If your child isn't into flying to the moon in the Shuttle Imagination, KidsCraft also offers a wonderful Creation Cottage that is sure to be a hit as well. One lucky person will win their choice of a Shuttle Imagination (ARV $69.95) or Creation Cottage (ARV $59.95) from KidsCraft! To enter to win: Visit KidsCraft and tell me one interesting thing you learned about the company. 3 Extra Entries if you blog about this giveaway linking back to Thanks, Mail Carrier and KidsCraft. Please leave an address where it can be found. A huge thank you to KidsCraft for providing a Shuttle Imagination for me to review as well as the choice of a Shuttle Imagination or Creation Cottage for one lucky giveaway winner. The opinions shared are my own and honest and if you really need to see more, click here to see how I roll. I learnt that their products are made from 100% recycleable materials and that they are 100% post play recyclable. I learned that they support children's charities and fund raising activities benefitting The Rainbow House and The Empty Stocking Foundations. I learned that the company supports children's charities and fund raising activities benefitting The Rainbow House and The Empty Stocking Foundations. I learned their company has received the Top Fun Tillywig Toy Award and The National Parenting Center Seal of Approval for 2010. They're made in the USA-yeah! 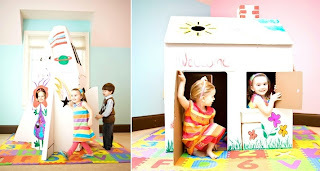 I learned their playhouses are 100% recycled cardboard material. The idea was inspired after seeing their children play with boxes. These houses are 100% recycled and are 100% recyclable! I learned that the company gives a percentage of all sales to charity. I'm a mail carrier fb fan! The company won The National Parenting Center Seal of Approval for 2010. KidsCraft is partners with Trees for the Future! I learned they are made from 100 % recycled material. I learned that they are made out of 100% recycled cardboard! I'm following KidsCraft on FB - Cari S. and I commented! I entered the Corel Paint It giveaway.